In every one's lifetime there will be an occasion to question what to do with an old furniture piece. Is it worthy enough to call a consignment store or do you haul it over to the Salvation Army? Sometimes the condition is just a little too good to make it a giveaway. Shouldn't you save it for when the Antique Road Show comes to your city? Then of course there's the sentimental value. It may conjure up wonderful memories when it once coveted the prime position in mom's living room. One thing is for sure. If you decide it's a keeper you'll probably have to spruce it up to make it feel comfortable in your home. 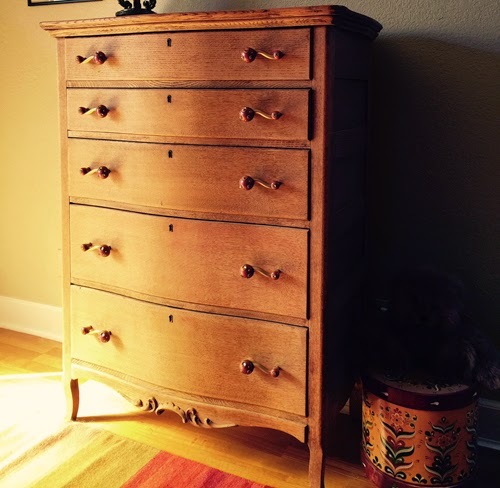 This doesn't mean you have to strip it and put on a new stain or paint. As much as I admire the creative energy that goes into into a new finish, not all DIY projects have to be that industrious. 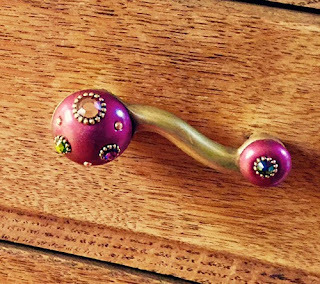 New decorative hardware can turn the mundane into something fabulous. It's the fashion of the day to see distressed and natural old wood finishes paired with elegant knobs and pulls. This empire dresser and our Style 6 Eel pulls look like they were made for each other. I especially love the freedom of the look and the way it blends the organic quality of the wood with artistic fabrication. There's something about it that is fresh, contemporary and long lasting. It gets my vote!